Liquorland field weekend nine was to be our Pania Shield weekend,unfortunately unless we want to play with ourselves we will need to reschedule to a later date. So this weekend will be a normal field weekend, With A Twist, with the possibility of cyclone Oma coming in late Saturday early Sunday we will have a start fishing time of 6pm Friday until midnight Saturday (no fishing on Sunday) normal boundaries apply with our weigh in at the fire station midday Sunday. 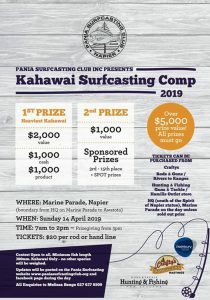 Heaviest Snapper, Average Kahawai, Heaviest other, Heaviest Kahawai, and a couple of chocolate fish spot prizes. This weekend is the second of our Hunting & Fishing early bird field weekends, fishing starts at 6pm Friday through to normal weigh in time of midday Sunday, normal boundaries apply, weigh in is at the fire station. Friday night could be a little challenging in most locations but Saturday looks primo, high tide 9.30pm Friday night and 10.15pm Saturday. 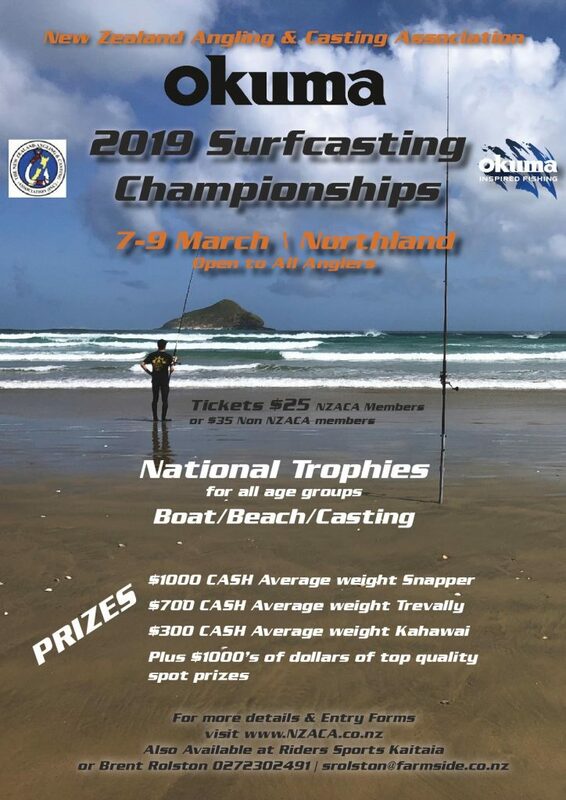 Great prize pool this weekend, our jackpot is up to $300 for a Kahawai over 2.8kg, prizes for heaviest Snapper, average Kahawai, best other and heaviest Gurnard. Total value of prizes is over $600.00 not including the chocolate fish. Field weekend 7 was kindly sponsored by Ahuriri Liquorland and was a Challenge Weekend whereby any member weighing in 3 or more species receives a bonus 300 points. 20 members fished FW7, with only 8 weighing fish, and of those 8 only Kane managed to gain the 300-point bonus. Kane was once again the standout in what was generally a very hard weekend, weighing 14 fish, including 6 snapper! Other notable catches were Sue Kemsley’s 5.1kg snapper and Mark Ives two 5kg+ Kingfish. For the first time this season no pin fish were weighed. Thanks again to Ahuriri Liquorland. Please get along and support our generous sponsors. Our next field weekend is on February 8,9 & 10th. Happy new year everybody!! 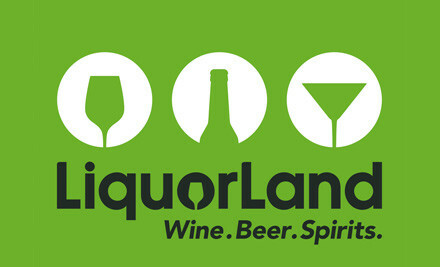 This weekend is field weekend seven, kindly sponsored by Liquorland Ahuriri and so named The Liquorland 300. Weigh in three different species and you will bank an additional 300 points over and above your normal points, the person who has the best bag weight from their top three fish will also be in the prizes. Start fish time of 5am Saturday, normal boundaries apply, and weigh in is at the fire station midday Sunday. Total prizes for this weekend are in access of $500. The Liquorland 300 winner, Best Snapper, Average Kahawai, Best other, chocolate fish winner and our jackpot fish a 2.8kg Kahawai is now up to an impressive $300. Please think about the BBQ Sunday the 20th and let Mel know at the weigh in if you wish to join us. Field weekend 5 and 6 have come and gone with mixed results in both with some members struggling and others doing quite well. 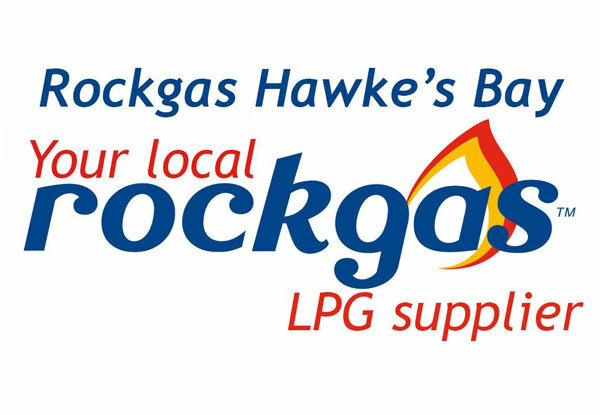 Field weekend 5 was generously sponsored by Hamill’s Napier and field weekend 6 sponsored by Rockgas. Thanks to both for their ongoing support of our club. There were 3 standouts in field weekend 5. Kane’s impressive bag of 19 fish was outstanding, including his limit of snapper. He also caught a pin trevally of 1.76kg. Tareq nailed a personal best pin snapper of 5.75kg. Well done mate! Last but not least Jimmy B weighed a very impressive pin snapper of 12.34kg. An awesome fish! Field weekend 6, which was our annual hams weekend, saw an annoying southerly hit Hawkes bay on Friday evening which definitely had an effect on results with fish numbers down on previous weekends. Twenty one members fished with only 31 fish being weighed. Oddly for this time of year no snapper crossed the scales, perhaps a result of the southerly coming through on Friday. Standout for field weekend 6 was once again Jimmy B with a solid pin kingfish of 9.84kg. Other pins went to Roy with a kahawai of 2.59 and Kane with a SSH of 6.22kg. Nice work lads. Our next field weekend is in the New Year on January 12/13. Rockgas HB is our sponsor this weekend, we have a great lineup of prizes, those that enter @ $10 per rod will get a prize, payment must be made by Friday night. If you don’t wish to enter the hams comp, this is a normal field weekend, with a start time of 5am Saturday, normal boundaries apply, with the weigh in at the fire station midday Sunday. Our Kahawai (over 2.8kg ) jackpot prize now stands at $200 so this weekend we have five prizes based around the humble Kahawai. Field weekend three was the first of the Crafty’s challenge weekends with the challenge being to weigh a trunked lemon fish of at least 65cm before any other fish could be weighed. For most, the challenge was to big with 20 of the 28 members who fished failing to catch a lemon fish! Of the 8 who did weigh fish the absolute standout of the weekend was undoubtedly Jimmy B who scored big with 10 blue moki a gurnard and a lemon fish. We believe it is the first time 10 blue moki have been weighed for a field weekend. Nice work Jimmy! Jimmy Beazley's notable catch from a local beach: 10 moki. Other notable fish to cross the scales included 8 pin fish. Jimmy B with 2 blue moki over 3kgs. James B with 2 kahawai over 2.5kg. Andy B with a trevally of 2.63. James P with a 2.09kg trevally. Mark R with a solid snapper of 6.83 and Hamish N with a 2.79kg kahawai. A huge thank you to Crafty’s for their ongoing sponsorship, it is greatly appreciated! Good luck to all fishing field weekend 4 kicking off on the 9th November. This is an early bird weekend with fishing commencing 6pm on the Friday night.